I have had such an amazing weekend. My beautiful cousin got married on Saturday and there is just something about weddings that brings out the sappy emotional side of me. I seriously bawl like a baby during the ceremony, the daddy-daughter dances, the couple dance and watching the couple leave the reception. It takes me back to my wedding day 5 and a half years ago. 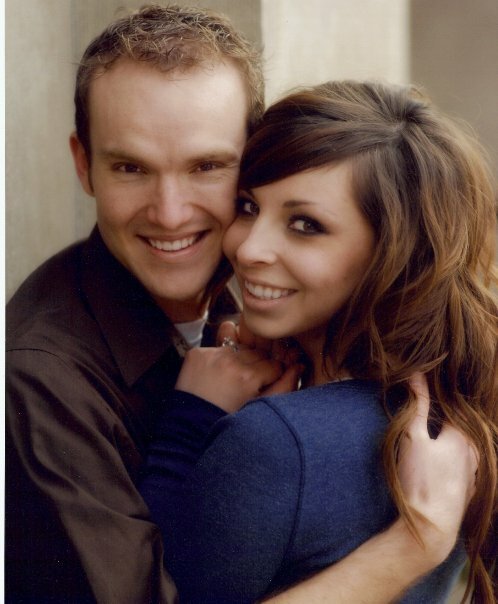 We look like babies then, but its amazing how much we have grown together as a couple :) I just love my husband. (Still on my sappy roller coaster lol!). It was also so great because ALL of my family came into town for it. I love my extended family, they are seriously my best best friends! My amazing aunt came and stayed with me for a few nights and helped me transform my family room on a budget. I just had so much brown, black and neutral colors and really needed to bring in some pops of colors- so she so kindly helped me get the ball rolling on that. She has an eye for these kinds of things. I am definitely not as big of a crafter as I would like to be lol! My cute grandparents also came into to town for it. Now, when my mom’s family gets together, there is ALWAYS great food to be found. We ate like kinds and queens this weekend. This recipe combines veggies and veggie dip and transforms it into a delicious pizza. It is ridiculously delicious! Try it out and see for yourself! Wow, you are the prettiest bride. You looked so happy! I love these photos!! The bars look great and super easy, which everybody need right now! Ha[[y Labor day! Gorgeous pictures; gorgeous couple! Thanks for sharing! The veggie bars look amazing, too! Can't wait to try your recipe! I am confused. How do you cut into bars if you are using biscuits? Do you split the biscuits after they are baked? Yours look perfectly square. Please explain. oh my goodness! Thanks for catching that! I meant to say crescent rolls not biscuits. Sometimes my recipes have word predictors and as I was typing Pillsbury that is what it wrote. I apologize. It uses crescent rolls, which lay flat on the pan forming a crust. Ahhh Nikki your pictures are gorgeous! Isn't funny how we feel totally grown up at some moment and then look back later and think, "oh my gosh I was just a kid..." ha ha! I have only been married a year and a half and already think that about my own wedding! Lovely pics, and these veggie bars look de-lish! Wow, this is a great idea....but I don't like Mayo or Ranch....I'm thinking of a variation, maybe hummus? You could even try it with pita! 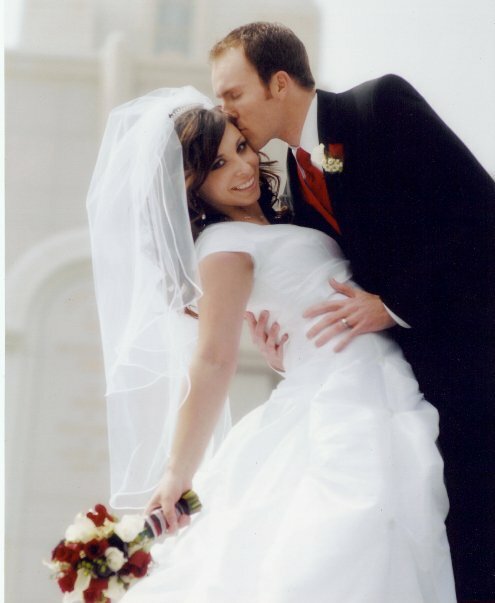 What beautiful pictures of you and your husband. 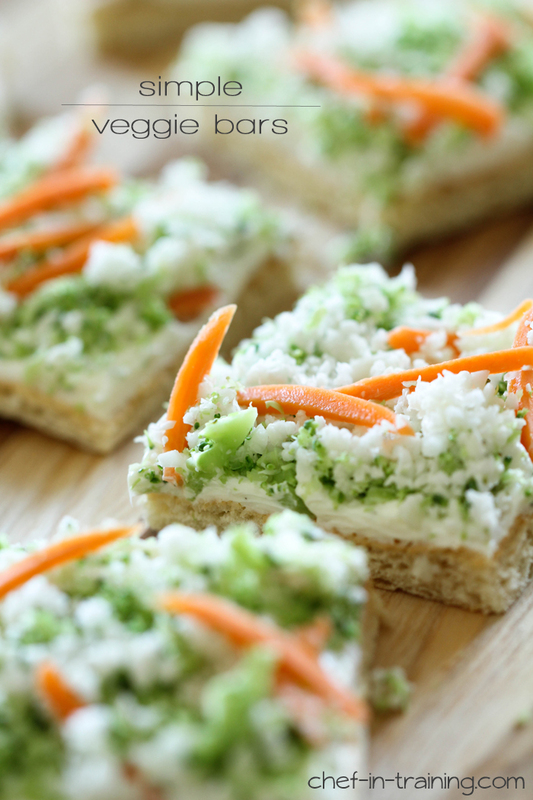 Weddings make me like that too:) These veggie bars look great! I can't wait to try them! That pic is gorgeous Nikki!! That dress was SO gorgeous! Awwww, love the pictures - you two are ADORABLE! And these veggie bars - yes please! I need them after all this heavy eating I've been doing lately! Nice recipe - thank you. Beautiful handsome couple. Such lovely photos of you and your hubby! I just love this recipe! I am definitely making soon! Such a great idea! Made a half recipe, but kept the same amount of veggies. I think it could have used even more veggies. After mincing them in the food processor, I mixed the veggies into the cream cheese mixture so that my little ones didn't have a hard time keeping the veggies on the bars. I sprinkled shredded cheddar cheese on top; next time I'll mix that in too. Everyone really liked these.